Online tool created by Institute of Economic and Social Studies shows complete breakdown of member states’ costs and guarantees for the rescue of the Eurozone. The fiscal storms of 2010-2012 are gone, but the crisis in Eurozone is far from being a history. Continuous fiscal problems in Greece, banking problems in Portugal, or repeatedly missed deficits in France signal continuous struggle. The first “rescue round” of 2010-2012 was heavily felt by the citizens of the rescued countries. Despite providing hundreds of billions worth help, the citizens of the core were shielded from the imminent impact. 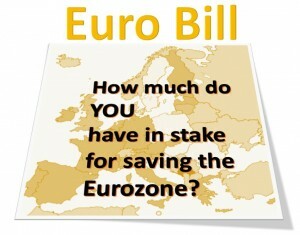 ECB, EFSF and ESM enabled to summon the money without seriously affecting national budgets. However, the bailout guarantees provided by the member state tax payers may come back to the headlines very swiftly in the moment when one of the PIIGS countries finds repaying the bailout impossible – or unwilling. Every taxpayer in Eurozone provided a multi-thousand euro bet on the future of Eurozone – and most of them do not know any details about it. Therefore INESS decided to create a complex, but easer friendly online tool, which provides users with detailed financial data about Eurozone rescue costs, broken down to each member state. The tool shows how much funds were actually already provided and how much was guaranteed in absolute numbers and per capita. The tool itself can be found here. More details about the items can be found here. The data is regularly updated and can be freely downloaded here. The creation of the Euro Bill was possible thanks to generous support of Anasoft. Tento článok bol publikovaný v English articles autorom Martin Vlachynský. Bookmarkuj permalink.